The Gardner that comes monthly hates that I put I garden up against the wall and is very liberal when spraying poison around the strip…. you can see how wide the dead zone is – its not mulch, its where the ‘gardener’ sprays poison! I’m sure that if I put up a proper border around the strip he wouldn’t be compelled to poison so far out. Actually- now I write about it, Ive decided that poison will no longer be used here at this block of flats! No idea what he has been spraying around for the last couple of years but there is no need for it! Low light. These guys are planted on the building side of our south facing fence. 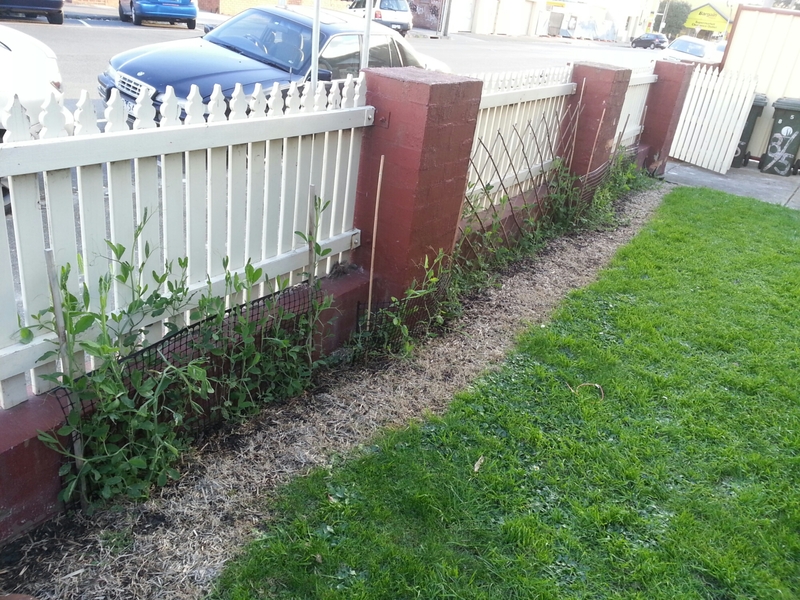 I got a bit over ambitious after the success of last years sun flowers but forgot that they took twice as long to grow taller than the fence line, than I expected. In fact, I think I planted them about this time last year. 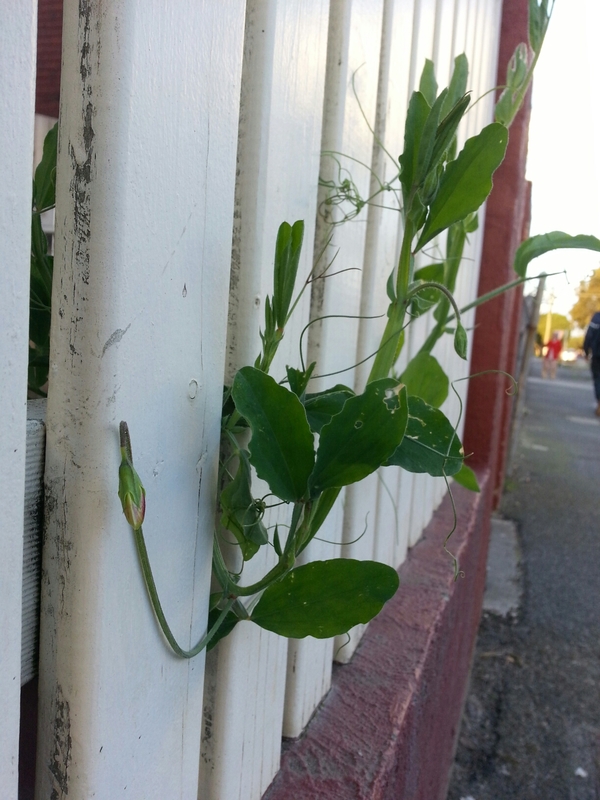 Now that some of the sweet peas have gotten taller than the brick work they are starting to develop better. I cut corners on trellis. I imagined that they would quickly grow without support to the level of the pickets where they would attach and create a beautiful thick sweet smelling hedge! Not quite how it worked in reality. On my way in the front gates this evening, I noticed that there was a flower forming on one of the stems I pushed through the pickets. Hard to see…. but I promise it is there! More pics to come when it opens- hopefully tomorrow! I really want to replicate the sunflower strip again this year…. I think it might be wise to plant the seeds in between the sweet peas NOW!